Designed for older dogs, seniors or dogs with slower metabolisms, Adult is also a popular formula with kennels. Annamaet Adult is made with antibiotic free chicken, brown rice, and is corn, wheat, and soy free. 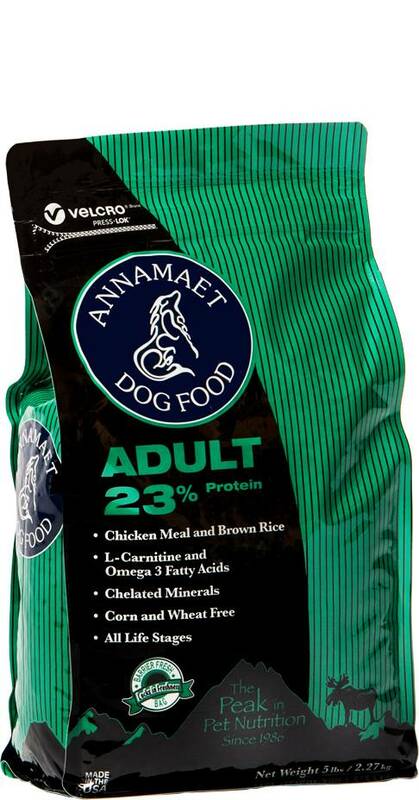 Annamaet Adult is formulated to meet the nutritional levels established by the AAFCO dog food nutrient profiles for "ALL LIFE STAGES" (Gestation, Lactation, Growth and Maintenance). Chicken Meal, Brown Rice, Millet, Rolled Oats, Pearled Barley, Chicken Fat (Preserved with Mixed Tocopherols (Vitamin E)), Dried Beet Pulp, Brewers Dried Yeast, Flax Seed Meal, Menhaden Oil (Preserved with Mixed Tocopherols (Vitamin E)), Carrot, Celery, Parsley, Lettuce, Watercress, Spinach, Fat Product (Algae, Source of Fatty Acids), Lecithin, Salt, Calcium Carbonate, DL Methionine, L-Lysine, Cranberries, Lactobacillus Acidophilus Fermentation Product Dehydrated, Oligofructose, Yucca Schidigera Extract, Potassium Chloride, Vitamin E Supplement, L-Ascorbyl-2-Polyphosphate (source of Vitamin C), Niacin Supplement, Biotin, Thiamine Mononitrate, L-Carnitine, d-Calcium Pantothenate, Riboflavin Supplement, Pyridoxine Hydrochloride, Vitamin A Acetate, Vitamin B12 Supplement, Vitamin D3 Supplement, Folic Acid, Choline Chloride, Zinc Proteinate, Betaine Anhydrous, Iron Proteinate, Selenium Yeast, Copper Proteinate, Manganese Proteinate, Calcium Iodate.